The dog that attacked and killed a 64-year-old Grover Beach man was an Exeter Police Department K-9. Grover Beach Police Officer Alex Geiger was the dog’s handler during his time with the Central Valley police department. Geiger left Exeter to join the Grover Beach force in September. That month, Geiger purchased the Belgian Malinois named Neo from the city of Exeter for $5,287.50. Geiger brought Neo to Grover Beach as his personal pet. On Dec. 13, Neo attacked Betty Long, 85, in front of her Grover Beach yard. Long’s neighbor, David Fear, went to assist the woman, and the Belgian Malinois turned his aggression on the Grover Beach man. Long suffered a broken pelvis and broken shoulder. She is still in a rehab facility. The Exeter Police Department said in a news release that Neo was trained and certified in narcotics detection and all areas of patrol operations. Sources from within the department told CalCoastNews Neo had some training and behavioral issues. Despite being trained as a police K-9, the dog was never utilized in response to a call. Geiger, 25, only served on the Exeter force for one year before joining the K-9 unit. Most law enforcement agencies require officers to work for seven years before joining the K-9 unit. Geiger previously worked as a Kings County Sheriff’s deputy in 2012 and 2013. The Grover Beach Police Department hired Geiger as a standard police officer. Grover Beach does not have a police K-9 program. Following the attack, Geiger turned over Neo to San Luis Obispo County Animal Services, which euthanized the dog. Animal Services completed its investigation into the incident late last month and submitted the case to the SLO County District Attorney’s Office. Prosecutors have yet to announce whether they will file charges. Geiger is on paid administrative leave from his Grover Beach job. 1. Officer Geiger taught his dogs to knock people down, bite them in vulnerable places and chew their hands off, among other things. 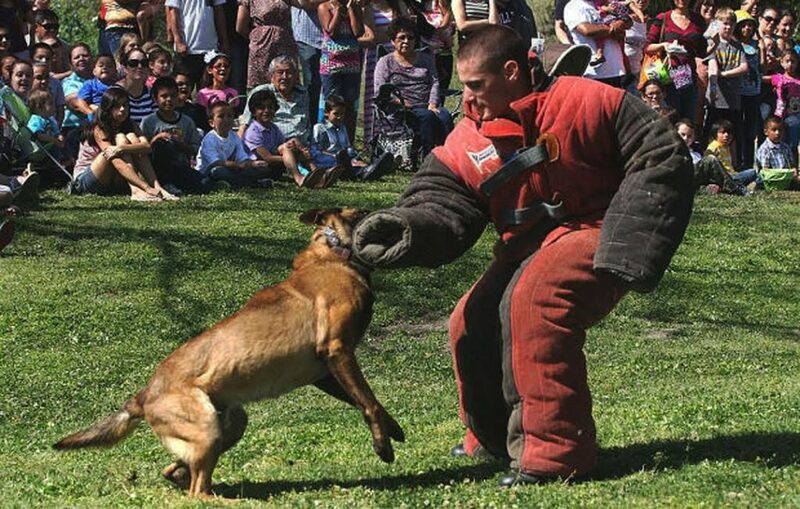 At least one of his dogs—Neo— was so good at this that it was “certified” as a narcotics and patrol dog. 2. Neo and another one of Officer Geiger’s pets escaped/wandered out of Geiger’s property and subsequently wandered onto Mrs. Long’s property at which time Neo began to employ what Geiger trained him to do (being paid with our tax dollars all the while) and knocked Mrs. Long to the ground, fracturing her pelvis and shoulder and causing multiple lacerations and bite wounds…..displaying a “text book” takedown of a citizen, exactly as trained by Officer Geiger. 3. At some point during the time Neo was practicing his training on Mrs. Long, Mr. Fear began to defend Mrs. Long from the vicious attack and the dog turned on Mr. Fear. Officer Geiger taught Neo to chew hands and wrists, which he did very well, severing arteries in Mr. Fear’s arms, causing him to lose 6 pints of blood….a mortal injury. 4. Mr. Fear died from his injuries 4 days after the attack, while Mrs. Long—although saved from death by Mr. Fear’s heroic intervention—–is still gravely injured and will never fully recover from her injuries. 5. Neo was destroyed by Animal Services, while Officer Geiger’s other pet was not. An investigation took place, conducted by Animal Services and then referred to DA Dow’s office upon conclusion, some weeks ago. 6. NO CHARGES HAVE BEEN FILED. OFFICER GEIGER IS STILL ON PAID ADMINISTRATIVE LEAVE AND IS STILL IN POSSESSION OF ANOTHER DOG. A. While it is a criminal act for a non-badged, non-general immunity enjoying citizen to train a dog to viciously attack people; at the same time when a cop does the same thing they are paid a salary from tax dollars engage in what would be criminal behavior for everyone else. B. Pets owned and trained by a police officer who trespass onto other people’s property and aggressively attack them may be destroyed by Animal Services, or not, depending on the degree of aggressiveness displayed. C. Despite a death and a grave injury caused by his pets following their training, Officer Geiger does not appear to share any guilt or responsibility for his pets or his training of them. And we’re forgetting about this? Right here in our town? I guess we’re all OK with the idea that cops’ are more important and enjoy special rights and privileges above and beyond the rest of us? “Blue” lives matter…..but not the rest of us? And we’re OK with this? Shame on us! Welcome to the police state. Our lives mean nothing. well any updates.. what is the lag with charges being filed. You’re probably thinking that the law applies to everyone equally. It doesn’t. Cops are special. They are allowed to break laws….especially the ones they enforce on us. Take laws against training vicious dogs for example: Michael Vick’s dogs didn’t even kill anyone and he went to prison for teaching his dogs to be vicious killers. While it’s true that, Vick’s dogs weren’t taught to kill people and he kept them locked up….. he stil went to prion for dog fighting, animal cruelty and making false statements to a police officer. Officer Geiger’s pets, like Michael Vick’s, were trained to be vicious killers too. But he’s a cop and the dog only killed one person, so he’s not a terrible person like Michael Vick was and doesn’t deserve punishment on par with Vick’s. Charges—if there are any—-will be mild. My best guess is that right now there are negotiations between the families and the various guilty parties. Charges, if and when they come, will take into account any agreements between the various parties and the DA will take into account that officer Geiger’s rights trump those of Mr. Fear and Mrs. Long and adjust the charges accordingly. Only one person died and one other was gravely injured. That’s no big deal for a cop. It’s a daily thing in many places. Really, if you think about it, there really isn’t a good reason to file charges. People are starting to forget about this. The extreme sarcasm displayed in the preceding paragraphs was intended to highlight the extreme double standards that now exist between serfs and noblemen. The fact that it has gone this long without charges being filed is a travesty. We’re screwed if we ever cross a cop or his pet.